In the world around us, no matter where we look, we can find repeating forms. The windows of my dorm’s common room have wires crisscrossing in a diamond pattern to add durability. Well-made tile floors have perfectly matching sides to keep them relatively smooth and pleasant-looking. 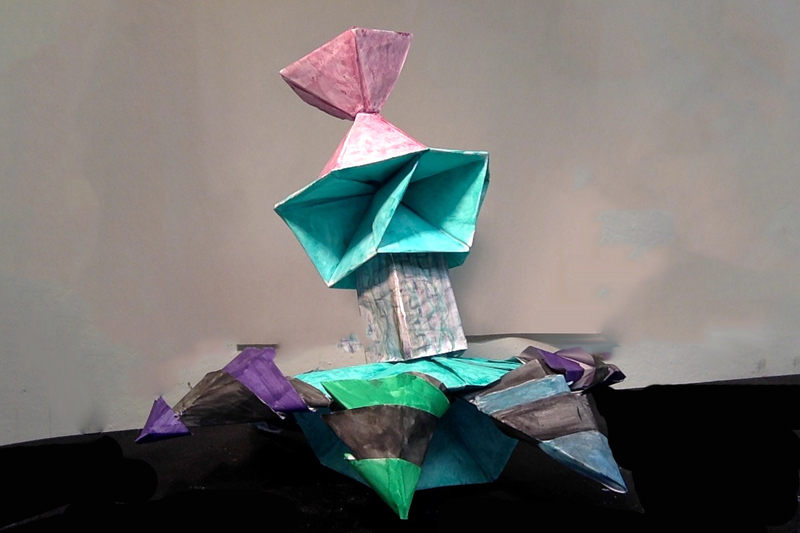 Along those lines, the origami sculpture Taylor Stevenson and I created uses paper modules in order to achieve a shape that would be more difficult to create and less aesthetically pleasing had we used solid parts. The piece is almost entirely constructed of triangular shapes which interlock to form a repeating pattern along the sides and adds an up-and-down movement of the eyes, as they alternate pointing up and down. It also adds a sense of stability to the piece, as when it is sitting flat on a table all of the triangles’ bases are flat. On the other hand, the outward-pointing shapes’ drastically different color directs attention, and their shape points down and outward from the piece’s center. The implied line will, when set on a table, meet the surface, creating another triangle with its base flat- another stable form. However, if worn on the head, the body becomes a line on the triangle, moving the base from being flat to not so; this creates a different air of movement. Ironically (or not so ironically), the triangle is also an indicator of change. It’s fitting that our sculpture, which changes depending on its placement, contains a large amount of them. This entry was posted in Non Time-Based and tagged 3D Design. Bookmark the permalink.